Purple Hot slot machine is an exceptionally simple game from Playtech. The mobile slot has 5 reels, just 5 paylines, and whilst there aren’t any bonus features there is a pretty good maximum jackpot of 5,000x per line bet. Keep reading below for all the details of the full Purple Hot slot review below. While we agree that when it comes to online video slots, bigger isn’t always necessarily better, it’s also possible to create a game that is so minimalist and devoid of features that it simply beggars belief. Unfortunately, the Purple Hot slot from the Playtech slots team is one such game. Featuring five reels and just five paylines, the game strives to provide a fresh take on the classic fruit machine but somehow misses the mark. 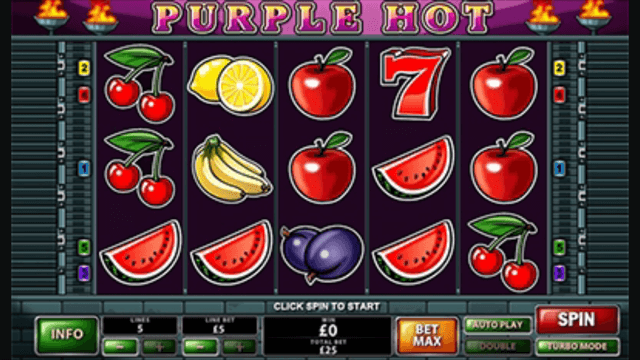 The slot is neither hot nor particularly purple in its design, with the reels appearing on top of grey brickwork for no particular reason and the symbols featuring a standard array of fruit and lucky sevens. The end result is a game that looks strangely reminiscent of the maze screensaver that used to appear on older versions of Windows – and the gameplay is about as functional. Not only are there no free spins or bonus features available, but there’s not so much as a substitute wild knocking around to make the experience a little less painful; and this in turn results in a relatively low RTP of 92.33-94.33%. While the Purple Hot slot machine can be “enjoyed” across all desktop, mobile and tablet devices from as little as £0.01 per spin, if you really want to get anything out of the game you’ll need to play for at least £2 per turn. This is the minimum threshold required to put you in the frame for the game’s progressive jackpot payout, which is only triggered when you line up five of the lucky seven symbols on an active payline. You should also be aware that this feature is only available when you spin with all five paylines activated – and if the progressive jackpot is triggered while playing for less than £2 per game, you’ll instead receive a consolation prize of 5,000x your bet per line amount. All this should only serve to put you off the slot further, but if you are determined to take Purple Hot for a spin, you may be pleased to know that all winnings can be gambled in a standard high/low picking game for additional payouts. Never before have we seen a game so utterly unstimulating and devoid of fun as the Purple Hot slot. The title is lacking in virtually every measurable area and tacking on a progressive jackpot isn’t anywhere enough to save it from the video slot abyss. Like the Purple Hot slot review? Check out these as well…..